Deluxe (ready made wooden windows). Standard model has Mdf machined windows and surrounds. P+P is the same as deluxe. Large Georgian House includes the Basement 4 floor in total. The Drawer base is not part of the house. 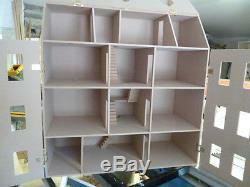 And are made to order to fit any size or make of Dolls House. How high, wide and deep. Rooms are 15" deep x 14" wide hallways are 6" wide 15"deep. Kitchen in Basement is 20" wide x 15" deep or you could fit another room divider to make a smaller Kitchen. Attic Rooms there are 3 rooms rangeing from 7" to 10" room divider can be place where you want them to create the room sizes you want. Comes with return stair treads. Draw base is not included. Made to fit any House. 3 ft wide large room Georgian House. Windows are made of wood and come ready made. 36" (910 mt) wide x 36" (910 mm) high x 21 (570 mm) deep. All our houses are made from 9mm MDF (external and internal walls) and are designed and built in Carmarthenshire, Wales by us. DHD dolls house direct aim to supply top quality miniatures accurately scaled to 1/12. Most made in both scales 12th and 24th. Established 1989 entering our 29th year. 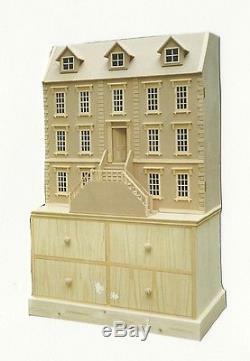 The item "Dolls House 1/12th The Templton Manor KIT Deluxe or Standard 3ft wide" is in sale since Monday, January 07, 2013. This item is in the category "Dolls & Bears\Dolls' Miniatures & Houses\Dolls' Houses". The seller is "dolls-house-direct" and is located in Velindre, Carmarthenshire. This item can be shipped worldwide.